Brian Wiersema, manager of Virginia Tech’s pilot plant. When Tyson Foods developed a new way to make jerky, it needed to make sure its production method was safe. Therefore, it turned to Virginia Tech’s Food Safety Pilot Plant. “This pilot plant is especially designed to allow us to work with food pathogens like salmonella and listeria in real food-processing conditions,” says Joseph Marcy, a professor and head of the food science and technology department at Virginia Tech. The department has a 2,200-square-foot food safety pilot plant and a 7,100-square-foot food processing pilot plant that allows industries to evaluate the safety of products and test new equipment and production processes. The facilities allow companies to conduct tests without disrupting production at their manufacturing plants. Since their opening in March 2014, the facilities have attracted $2 million in industry investment, Marcy says. Most of that has come from cash donations, but the total also includes some donated equipment. Tyson Foods, for example, donated smokehouse and commercial ovens when testing was being done on its products. Tessa, an Israeli company, also plans to donate a mini-dairy, which Virginia Tech will use for research and outreach purposes. “There’s nothing like it in the U.S.,” Marcy says about the dairy equipment. A big draw for companies is the facilities’ versatile space. Often, businesses want to bring their own equipment to conduct research. The company equipment helps Virginia Tech keep costs in check while not investing in machines that may soon become obsolete. 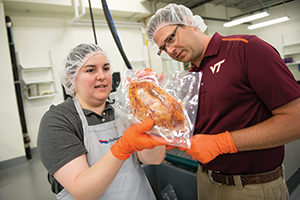 DuPont Teijin Films, a maker of polyester films, allows Virginia Tech to use its packaging equipment for a program that lets companies test new ways to package and prepare foods. “This is to our advantage,” Marcy says since DuPont Teijin Films maintains the gear and also hires workers for the project. Virginia Tech, however, has made its own notable investment, installing a $250,000 brewhouse in the food processing plant. It could be used by craft breweries to test production of new beers without shutting down their current production process. “You’re seeing a very fast expansion of brewery capabilities in the state, so to have a state-of-the-art place where people can come and interact with scientists at Virginia Tech is … going to be very valuable,” Marcy says.